Pentacryl is a product that was originally created for museums to stabilize old waterlogged pieces of wood by penetrating and combining with the water molecules. Pentacryl will keep troublesome woods from cracking and spliting. On average it takes about 4oz of Pentacryl to stabilize one board foot of medium density wood. Pentacryl adds no color to the wood, is non toxic when dry. It can be finished with oil, lacquer or waterbased finishes. Apply it to roughed out green turnings by either soaking or brushing on until saturated and then left to dry. 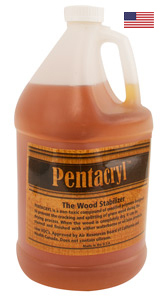 Pentacryl works best on wet wood. An additional $5.00 shipping charge applies to the Gallon size of this product, and will be added to normal shipping on your order.